By the water’s edge—nestled on tranquil Bailey Island in Midcoast Maine and located just over the world’s only Cribstone bridge. 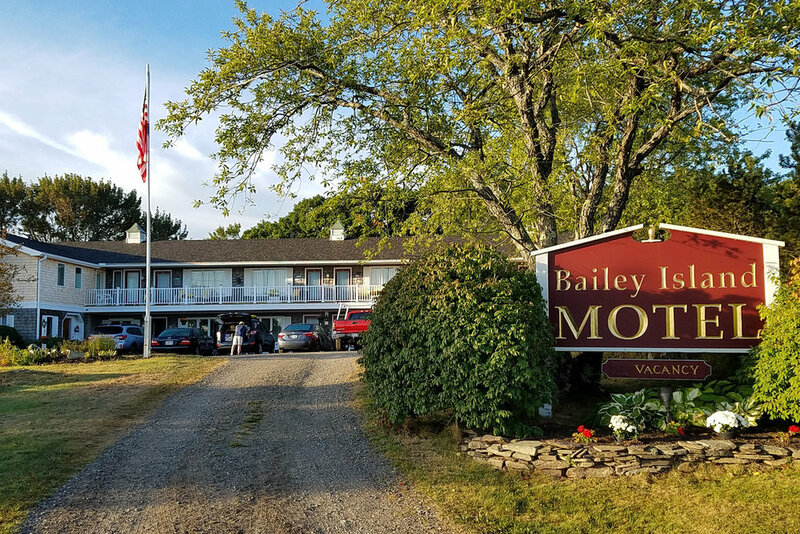 Welcome to the Bailey Island Motel—ideally situated to make the most of your Maine vacation. Whether you’re looking for solitude, great restaurants or to explore the many area attractions, the Bailey Island Motel is unique. We are located within walking distance to the famous Cook’s Lobster & Ale House, Morse’s Cribstone Restaurant and a short drive to Giant Staircase Grille, ‘BIGS’ the Bailey Island General Store, and Lands End Gift Shop. Also if you like hiking, Harpswell Heritage Land Trust has many trails on the islands that offer much to see. The islands surrounding Bailey Island are rich in tales of pirate treasure and adventure. Bailey Island, originally called Newaggin, was first settled by Will Black, a trader from Kittery in the 1600’s. The island was later claimed by Deacon Timothy Bailey of Hanover, Massachusetts, who bought the island for 1 pound of tobacco and 1 gallon of rum. He named the island for himself. Gold was supposedly found on Elm Island, Cedar Ledge and Pond Island. Pond Island is also the site of the ghost tale telling of a murdered pirate who stands guard over a buried treasure. Guests enjoy a complimentary continental breakfast of fresh baked muffins, cereal, yogurt, coffee, tea, and juice. Available daily from 7am until 10am. Wharf and moorings are also available. To commemorate your travel experience, we offer a small gift shop in the lobby featuring t-shirts, sweatshirts, hats, and miscellaneous gift items. *Rates reflect per night for one or two people per room. For every additional person in room it is an additional $15.00 per person per night. For anyone wanting to block 6 rooms or more for weddings or gatherings there will be a minimum of 2 nights stay. Live music on the deck overlooking the water. What a fantastic place!! This was our second time staying there! We take the ferry over one day, then stay the night without the car and hop back on the ferry the next day! Jane the front desk person was awesome! So friendly......The morning muffins are so delicious. And having the use of kayaks is great. The location is perfect! You can walk everywhere. Or you can relax in one of the chairs on the lawn. "I just sent my friends an e-mail to tell them that I have just found the address of Heaven. We have enjoyed this place so much I want to come back every year." — Harriett T. from Austin, Texas"
Fire pit and picnic tables! Sweetest place in Maine ! If you’re looking for a sweet, charming, cozy & comfy place to stay in Mid Coast Maine... This is the place ! The location of this hotel cannot be beat. Beautiful views. Our room seemed very recently remodeled and was clean and comfortable. The office hostess is a beautiful reflection of Maine hospitality. We will return. "I can't believe places like this exist. My wife and I feel like we have just spent a week in Paradise… sitting out on those Adirondack chairs in the morning to watch the sunrise is an amazing experience. What a view!" Stayed first week of June for a week. Motel upgraded from previous years. Located on Casco Bay. Restaurants located nearby. Jane made sure everything went smooth all week! Complementary coffee and freshly baked muffins baked fresh every morning! served from 7 to 10 every day. Also yogurt and cereals etc. Friends stayed here all week for college reunion; nine of us and not one problem. Also free use of kayaks. Will return! !